The Yield Curve is a graphicalTypes of GraphsTop 10 types of graphs for data presentation you must use - examples, tips, formatting, how to use these different graphs for effective communication and in presentations. Download the Excel template with bar chart, line chart, pie chart, histogram, waterfall, scatterplot, combo graph (bar and line), gauge chart, representation of the interest rates on debt for a range of maturities. It shows the yield an investor is expecting to earn if he lends his money for a given period of time. The graph displays the bonds’ yieldYieldYield is defined as an income-only return on investment (it excludes capital gains) calculated by taking dividends, coupons, or net income and dividing them by the value of the investment, expressed as an annual percentage. The yield tells investors how much income they will earn each year relative to the market value or initial cost of their investment. on the vertical axis and the time to maturity across the horizontal axis. The curve may take different shapes at different points in the economic cycleBusiness CycleA business cycle is a cycle of fluctuations in the gross domestic product (GDP) around its long-term natural growth rate. It explains the expansion, peak, recession, depression, trough, recovery, expansion, and the entire business cycle keeps repeating in this loop. See examples and descriptions of the stages., but it is typically upward sloping. A Fixed IncomeFixed Income TradingFixed income trading involves investing in bonds or other debt security instruments. Fixed income securities have several unique attributes and factors that affect their price and value. Fixed income investing is favored by investors who prefer low-risk investments with a guaranteed return. Analyst may use the yield curve as a leading economic indicatorEconomic IndicatorsAn economic indicator is a measure of the overall state of the macroeconomy. Economic indicators are often collected by a government agency or private business intelligence organization in the form of a census or survey, which is then analyzed further to generate an economic indicator. Analysts and investors, especially when it shifts to an inverted shape, which signals an economic downturnThe Great DepressionThe Great Depression was a worldwide economic depression that took place from the late 1920s to the early 1930s. For decades debates have been going on abou, as long-term returns are lower than short-term returns. Learn more about bonds in Corporate Finance Institute’s free Fixed Income Fundamentals Course! This is the most common shape for the curve and, therefore, is referred to as the normal curve. The normal yield curve reflects higher interest rates for 30-year bonds, as opposed to 10-year bonds. If you think about it intuitively, if you are lending your money for a longer period of time, you expect to earn a higher compensation for that. 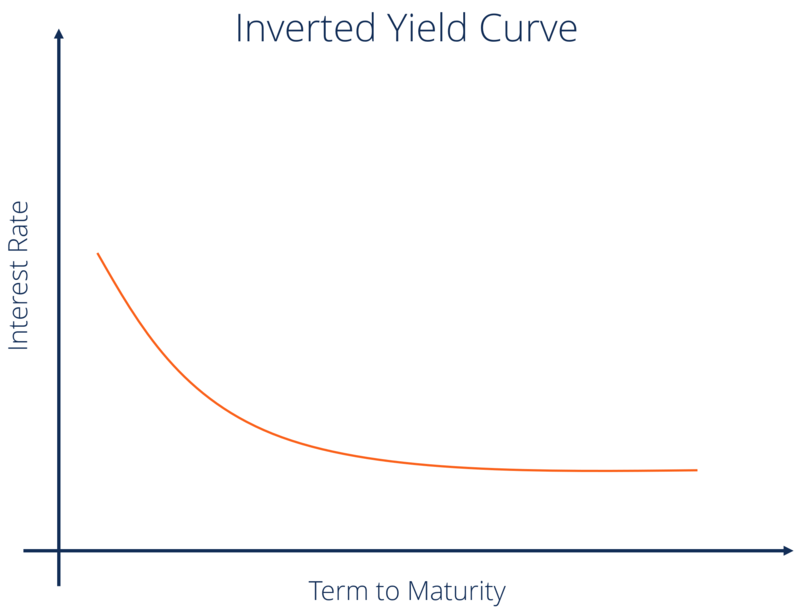 An inverted curve is when long-term yields fall below short-term yields.Calculating Yield on DebtDebt yield refers to the rate of return an investor can expect to earn if he/she holds a debt instrument until maturity. Such instruments include government-backed T-bills, corporate bonds, private debt agreements, and other fixed income securities. An inverted yield curve occurs due to the perception of long-term investors that yields will decline in the future. This can happen for a number of reasons, but one of the main reasons is the expectation of a decline in inflation.InflationInflation is an economic concept that refers to increases in the price level of goods over a set period of time. The cause for inflation in the short and me When the yield curve starts to shift towards an inverted shape, it is perceived as a leading indicator of an economic downturn. Such interest rate changes have historically reflected the market sentiment and expectations of the economy. 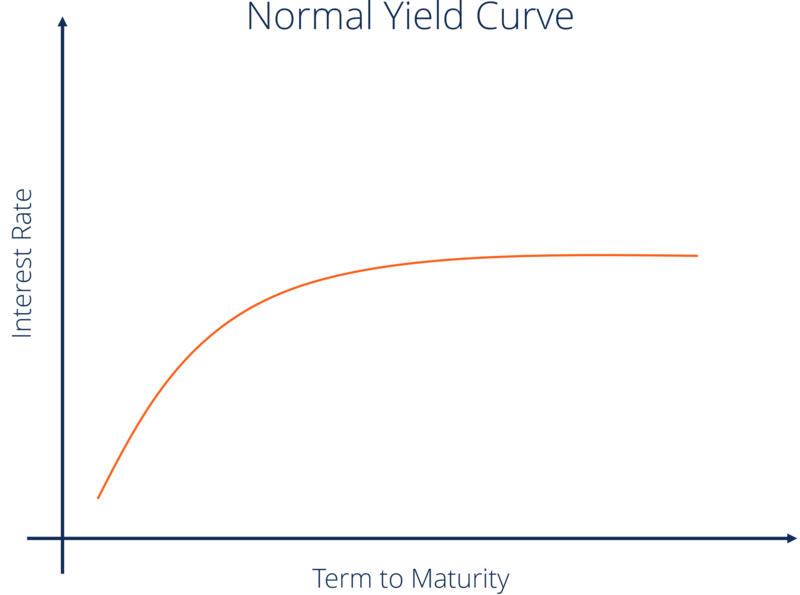 A steep curve indicates that the long-term yields are rising at a faster rate than short-term yields. Steep yield curves have historically indicated the start of an expansionary economic period. Both the normal and steep curves are based on the same general market conditions. The only difference is that a steeper curve reflects a larger difference between short-term and long-term return expectations. Learn more in CFI’s Free Fixed Income Fundamentals Course! 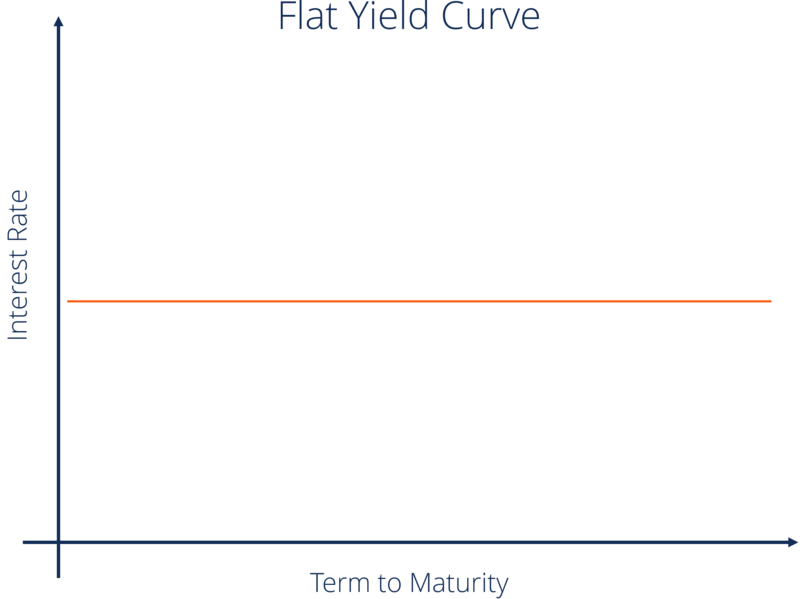 A flat curve happens when all maturities have similar yields. This means that the yield of a 10-year bond is essentially the same as that of a 30-year bond. A flattening of the yield curve usually occurs when there is a transition between the normal yield curve and the inverted yield curve. 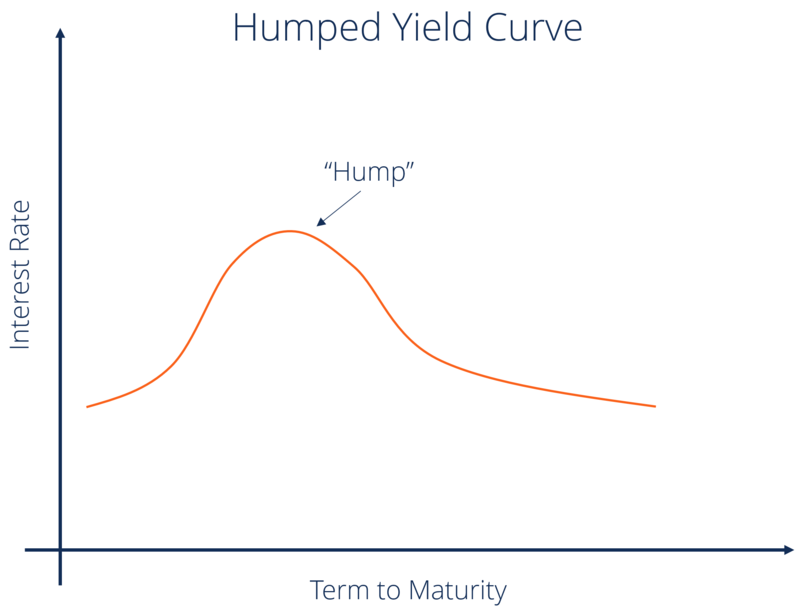 A humped yield curve is when medium-term yields are greater than both the short-term yields and long-term yields. A humped curve is rare and typically indicates a slowing of economic growth. The Humped Yield Curve is quite rare and rarely occurs. Central banksEuropean Central BankThe European Central Bank (ECB) is the central bank for all the European Union (EU) member states. The body has the responsibility to the euro... tend to respond to a rise in expected inflation with an increase in interest rates. A rise in inflation leads to a decrease in purchasing power, and therefore investors expect an increase in the short-term interest rate. Strong economic growth may lead to an increase in inflationInflationInflation is an economic concept that refers to increases in the price level of goods over a set period of time. The cause for inflation in the short and me due to a rise in aggregate demandAggregate Supply and DemandAggregate supply and demand refers to the concept of supply and demand, but applied at a macroeconomic scale. Both aggregate supply and aggregate demand are. Strong economic growth also means that there is a competition for capital, with more options to invest available for investors. Thus, strong economic growth leads to an increase in yields and to a steeper curve. If the central bank raises the interest rate on Treasuries, this increase will result in higher demand for treasuries and, thus, eventually lead to a decrease in interest ratesInterest RateAn interest rate refers to the amount charged by a lender to a borrower for any form of debt given, generally expressed as a percentage of the principal. The asset borrowed can be in the form of cash, large assets such as vehicle or building, or just consumer goods.. The shape of the curve helps investors get a sense about the future course of interest rates. 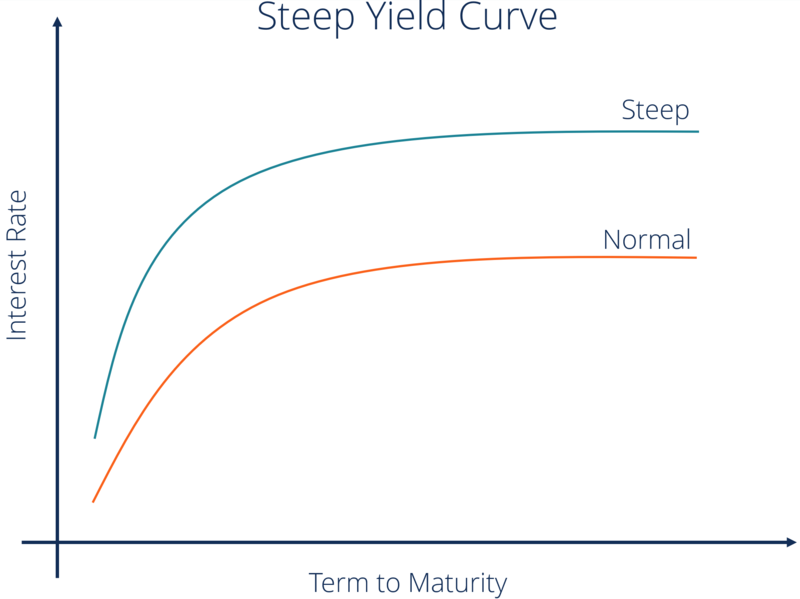 A normal upward sloping curve means that long-term securities have a higher yield. Whereas an inverted curve shows short-term securitiesTrading SecuritiesTrading securities are securities that have been purchased by a company for the purposes of realizing a short-term profit. Companies do not intend to hold have a higher yield. Banks and other financial intermediaries borrow most of their funds by selling short-term deposits and lend by using long-term loans. The steeper the upward sloping curve is, the wider is the difference between lending and borrowing rates, and the higher is their profit.Profit MarginIn accounting and finance, profit margin is a measure of a company's earnings relative to its revenue. The three main profit margin metrics are gross profit (total revenue minus cost of goods sold (COGS) ), operating profit (revenue minus COGS and operating expenses), and net profit (revenue minus all expenses) A flat or downward sloping curve, on the other hand, typically translates to a decrease in the profits of the financial intermediaries. Yield curve helps indicate the tradeoff between maturity and yieldRisk and ReturnIn investing, risk and return are highly correlated. Increased potential returns on investment usually go hand-in-hand with increased risk. Different types of risks include project-specific risk, industry-specific risk, competitive risk, international risk, and market risk.. If the yield curve is upward sloping, then to increase his yield, the investor must invest in long-term securities, which will mean more risk. Yield curve can tell investors if a security is temporarily overpriced or underpriced. If a security’s rate of returnRate of ReturnThe Rate of Return (ROR) is the gain or loss of an investment over a period of time copmared to the initial cost of the investment expressed as a percentage. This guide teaches the most common formulas for calculating different types of rates of returns including total return, annualized return, ROI, ROA, ROE, IRR lies above the yield curve, this means that the security is underpriced and if the rate of return lies below the yield curve, it means that the security is overpriced. 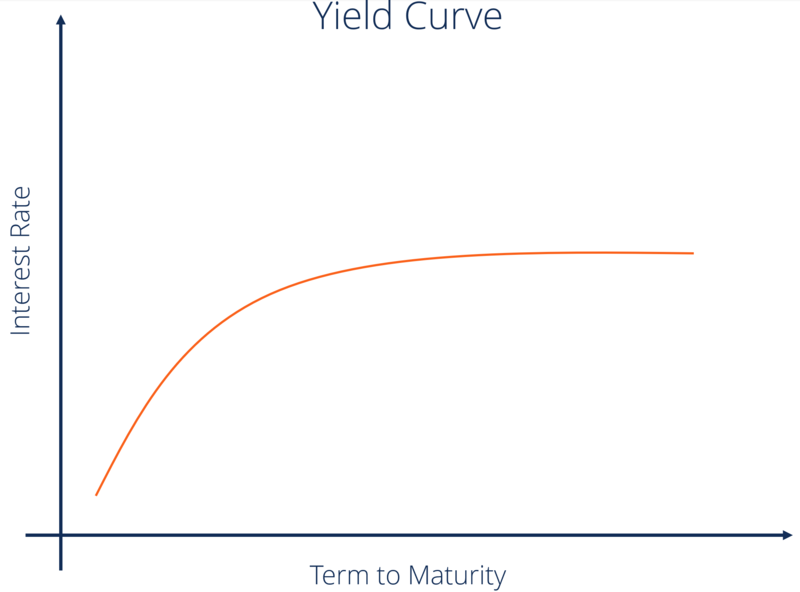 This theory assumes that the various maturities are substitutes and the shape of the yield curve depends on the market’s expectation of future interest rates. According to this theory, yields tend to change over time, but the theory fails to define the details of yield curve shapes. This theory ignores interest rate risk and reinvestment riskMarket Risk PremiumThe market risk premium is the additional return an investor will receive (or expects to receive) from holding a risky market portfolio instead of risk-free assets. The market risk premium is part of the Capital Asset Pricing Model (CAPM) which analysts and investors use to calculate the acceptable rate. This theory is an extension of the Pure Expectation Theory. It adds a premium called liquidity premiumLiquidity PremiumA liquidity premium compensates investors for investing in securities with low liquidity. Liquidity refers to how easily an investment can be sold for cash. T-bills and stocks are considered to be highly liquid since they can usually be sold at any time at the prevailing market price. or term premium. This theory considers the greater risk involved in holding long-term debts over short-term debts. The segmented market theorySegmented Markets TheoryThe segmented markets theory states that the market for bonds is “segmented” on the basis of the bonds’ term structure, and that they operate independently. is based on the separate demand and supply relationship between short-term securities and long-term securities. It is based on the fact that different maturities of securities cannot be substituted for one another. Since investors will generally prefer short-term maturity securities over long-term maturity securitiesHeld to Maturity SecuritiesHeld to maturity securities are securities that companies purchase and intend to hold until they mature. Unlike with trading securities or available for because the former offers low risk, the price of short-term securities will be high, and thus, the yield will be low. This is an extension of the Market SegmentationBusiness SegmentA business segment is a subsection of a company’s overall area of operation in which there is an established separate product line. A business segment can be identified by the product or services provided or by geographical locations that the company operates in. Senior management typically divides the overall company Theory. According to this theory, investors prefer a certain investment horizon. To invest outside this horizon, they will require some premium. This theory explains the reason behind long-term yields being greater than short-term yields. If you want to learn more about how to Price Bonds, check out CFI’s Fixed Income Fundamentals Course, a prerequisite for the FMVA™ Certification!FMVA™ CertificationThe Financial Modeling & Valueation Analyst (FMVA)™ accreditation is a global standard for financial analysts that covers finance, accounting, financial modeling, valuation, budgeting, forecasting, presentations, and strategy. Interest RateInterest RateAn interest rate refers to the amount charged by a lender to a borrower for any form of debt given, generally expressed as a percentage of the principal. The asset borrowed can be in the form of cash, large assets such as vehicle or building, or just consumer goods.